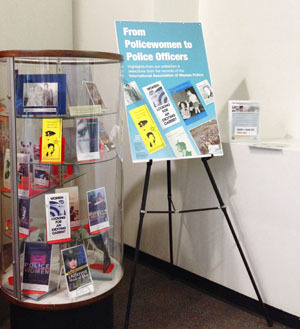 Exhibit: From "Policewomen" to "Police Officers"
See our exhibit case of resources related to the history of women police officers and the International Association of Women Poice in the Library's Niederhoffer Lounge, lower level. Female police officers have come a long way since the days of women police matrons. In the mid-19th century, women in law enforcement were limited to caring for women inmates and did not have the authority to make arrests. But the 20th century brought around incredible progress. Among the first policewomen, two stand out. In 1908, Lola Baldwin of Portland, Oregon was sworn in with an official badge, thereby becoming the first policewoman (Myers, 1995, p. 22; Duffin, 2010, p. 28). She had been working on behalf of unwed mothers and prisoners and in 1909 convinced the city council of Portland to establish the Department of Public Safety for the Protection of Young Girls and Women, which she directed. Others contend that the honor of becoming the first policewoman goes to Alice Stebbins Wells of Los Angeles (Higgins, 1951, p. 824). She was given the authority to arrest suspects, was responsible for the supervision of dance halls, skating rinks, penny arcades and theaters, and maintained a bureau for women seeking advice. Wells would go on to make a strong impact nationally as she toured and spoke on the value of introducing women as police officers in many local communities. In 1915, the National Association of Policewomen organized with Ms. Stebbins Wells as the first president. The objectives of the association included disseminating information on the work of women police and seeking better training and higher educational standards. By the mid-20th century, another star among women police had risen. Lois Lundell Higgins was a Chicago policewoman who headed the Crime Prevention Bureau in Chicago during the 1950s and 1960s. She had a charismatic personality, was well educated with a master’s degree in Social Work, and was acclaimed for her work in crime prevention, particularly among juveniles. In 1956, Ms. Higgins and other policewomen re-established the International Association of Policewomen but renamed it the International Association of Women Police or IAWP. * Membership was limited to women who were sworn police officers, and biannual conferences were held starting in 1958. Ms. Higgins became the association’s first president, a position she held until 1964. By the 1950s, women were starting to be assigned to investigative and undercover roles like their male colleagues. It was a time of transition—Ms. Higgins, for instance, was not in favor of women officers having roles expanded beyond focusing on troubled women and juveniles. The loss of women’s bureaus was also a contentious issue during this decade because it resulted in a temporary stagnation of women rising in rank; on the other hand, policewomen were becoming more integrated into police work previously done only by men (Hassell, Archbold, and Schulz, 2011, p. 24). Police departments were still appointing their first female officers during the 1950s and 1960s. By 1959, women officers in New York numbered 243 but only constituted 1% of the force. Progress was slow as civil service promotion for NYC policewomen did not occur until the 1960s. By 1969, there were no longer separate entry requirements for male and female officers, but there continued to be discrepancies in salaries for years. The modern era began during the 1970s when women were being accepted as police officers, not just policewomen (Hassell, et al., 2011, p. 128). “…The policewoman of the 1970s made greater strides toward equality among her male peers than at any other time in history” (Duffin, 2010, p. 198). During that era, some female officers won notable discrimination lawsuits and the right to patrol their own beats. While the fight for equality for women has been ongoing for decades, progress has clearly been made. The public is more accepting of female police officers and the number of women in the police forces across the nation has steadily increased. Changes have come if a male former chief of police could comment that “women brought a different contribution to policing than men…women officers are more compassionate in the ways they do their job…. [but] this happens only if they do not get co-opted into being police women rather than police women” (Duffin, 2010, p. 249). 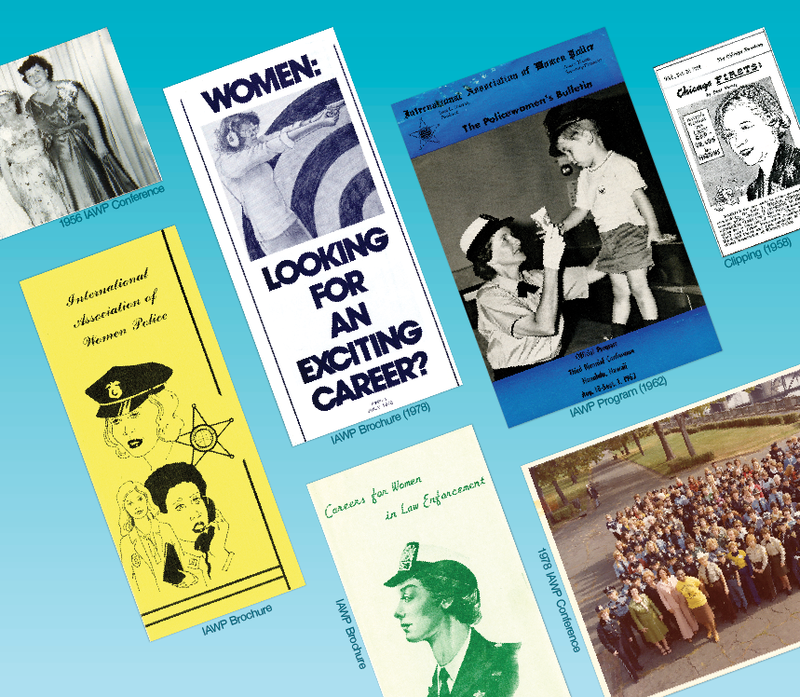 *John Jay College Library has the holdings of the International Association of Women Police (IAWP) in its Special Collections. A finding aid is available. Appointments must be made in advance to view these items. Duffin, A. (2010). History in blue: 160 years of women police, sheriffs, detectives, and state troopers. New York: Kaplan Publishing. Hassell, K. D., Archbold, C.A., & Schulz, D.M. (2011). Women & policing in America: Classic & contemporary readings. Frederick, MD: Wolters Kluwer Law & Business. Higgins, L. (1951). Historical background of policewomen’s service. Journal of Criminal Law and Criminology of Northwestern University School of Law, 41 (6), 822-833. Myers, G. E. (1995). A Municipal mother: Portland’s Lola Green Baldwin, America’s first policewoman. Corvallis, OR: Oregon State University Press.